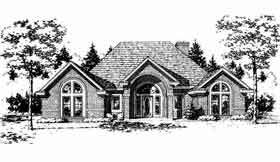 This attractive elevation uses brick detailing and arched windows to achieve an eye-catching home. A covered entry leads into the gallery area. A spacious living room looms in front of the visitor, highlighted by a fireplace centered in the rear wall. Cathedral ceilings top the family room and the formal dining rooms. The spacious kitchen and break-fast area includes an island and an L-shaped counter space. Sloping ceilings add interest to the front bedroom and the master suite. A covered patio extends the living area to the outside. 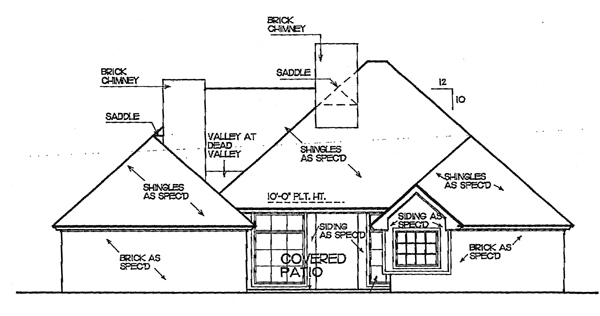 This is available with a crawl space or slab foundation. Please specify when ordering.